In March 1853, English painter Eyre Crowe visited Richmond. Having recently read Uncle Tom's Cabin, on his first morning in the city Crowe promptly located some advertisements for slave auctions in a local paper, asked someone at his swanky hotel for directions, and set off to witness the slave trade firsthand for himself. He didn't have to travel far--just a few blocks--before he located the nucleus of Richmond's slave trading establishments on Wall Street. He witnessed one auction, moved a bit down the road to another auction house to witness a second, and again to a third. In that third room, he took out paper and pencil to sketch a group of slaves waiting to be auctioned. Drawing these enslaved men and women rather than buying them was a suspicious and provocative thing to do. Fearing he might be an abolitionist, the dealers and buyers in the room soon threatened Crowe. While, by his own account, he didn't immediately flee lest he betray cowardice, he did display common sense; he soon if unhurriedly left, making his retreat from Richmond's slave district. But first, back to the Richmond Eyre Crowe saw. It was a crowded, unordered, messy, place. Today in Richmond, like downtowns in medium-sized cities throughout the US, buildings are often large, monolithic structures that rise above the streets. 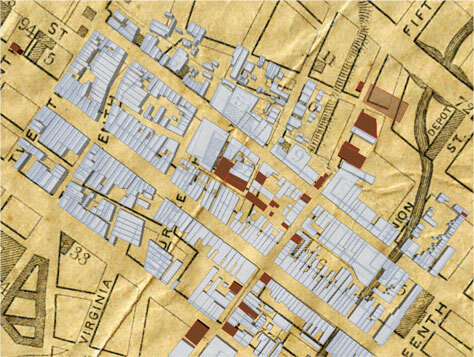 Blocks that in the 1850s, 60s, and 70s held fifty or sixty distinct structures today are home to a single large one, bearing witness to the intertwined consolidation of corporations across nation-states and across local cadastral maps. 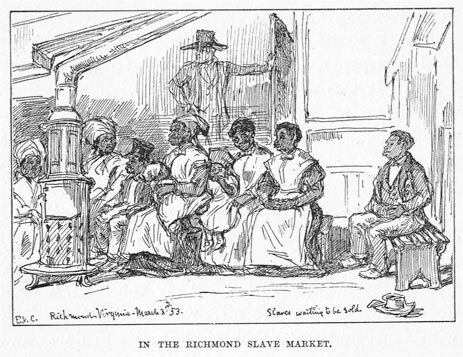 In some of Crowe's early sketches, we see conformity to the representational aesthetics of his day: "In the Richmond Slave Market" shows men and women mostly quiescent, sitting with their hands folded, mostly wearing smiles. Crowe's sketch differs greatly from many abolitionist sketches of the trade mainly in its lack of interest in the traders themselves-the trader here literally has faded into the hatched shadows-or in emphatically locating sin within the site of the slave trade. That Crowe was making the slave trade visible at all would be interesting indeed if he had attempted to publish his sketch in the U.S. But this sketch was for the London Illustrated News. Eyre Crowe, "Richmond, Virginia" Illustrated London News, 41.115 (July 26, 1862) 100.